Rare J Section - 2 Minute Walk to Best Surf Break in Guiones ! Casa Cristal de Mar (Sea Glass House) was recently renovated (November 2016) with major upgrades & additions throughout. We have set our home up for our frequent visits, with every convenience available for us and now YOU. This house is set up for pure relaxation. Surf, walk, or run on the beautiful miles long white sand beach just a short two minute walk from the house. Hang out in one of two hammocks while reading that book you have been meaning to finish or start up a game of ping pong. Hang out in the Rancho as you watch the monkeys in the trees above you. Each bedroom has its own full bath and private entrance off of the patio with total privacy. Perfect for four couples or two families. If you have to bring your work with you or just stay in touch with family and friends, bring your computer and connect with our WiFi connection and plug into our Magic Jack phone for FREE calls to the US and Canada. Very private. Fully surrounded property. We are a very busy family of 5 from Manhattan Beach, CA. Dad and the teen boys are avid surfers and think that Costa Rica is 'off the hook' for surfing !! They hope to get our youngest daughter to join them out on the Playa Guiones waves soon (she stood up her first time out !!). Mom just enjoys strolling the beach in search of amazing shells and sea glass. We will be visitors to our home often, and eventually plan to make Guiones our part time retirement home. After only one visit to Playa Guiones, we knew we wanted to buy property there and build our future retirement home. On our second visit, we rented this home and found out it was on the market. Soon after returning home, we gave up our search for a vacant lot and made an offer on this property. Gary has always had such a great eye for making things the best they can be - and so began our newest project - a new addition and remodel of our new home away from home. We absolutely LOVE the location of this property. It is just a short walk to anything and everything !! Playa Guiones is truly special and we couldn't feel more blessed to have a home there. Magic Jack Phone - Free calls anywhere in the US & Canada. Must bring your own laptop for connection. Also a local house phone for call within Coasta Rica. High Speed Internet gets great connects in the living room, outside & in the Rancho. Fully equipped, newly remodeled indoor kitchen. We have a receiver set up with a cable that will attached to any MP3 player or phone with music. Simply plug the cable into your earphone jack on your device and you will have your own music. Or, tune into a local station for radio. Choose from dozens of DVDs in our library. Single Story House with 2 story Rancho. Our house includes Bath Towels, Pool Towels, a full kitchen, a full Library of Books, DVDs and Games, Surfboard Storage, 2 Outdoor Showers, Safes in every Bedroom, Maid Service once weekly, Pool Service, Gardener, Ping Pong Table in covered Rancho, the BEST PROPERTY MANAGER in Nosara and so much MORE !! BEST Vacation and the Casa Cristal was the Most Valuable Part! Three families - 14 people - stayed in Casa Cristal in December and I think we all wished we lived there permanently. I'm not kidding when I tell you this is by far the best vacation home I have ever stayed in, including any beach house rental in the United States. Guiones could have something to do with it but seriously, it is perfectly equipped, even had sharp knives and any beach renter knows what I mean. The four bedrooms, each with own bath, was exactly right for our group. We had 6 adults (3 couples) and 9 kids ranging in age from 9-16. Two of the families had their younger children share the bedroom and then one couple was alone and the fourth bedroom was for the three 16-year old girls. We had plans to use the three outdoor beds in the upstairs area BUT between the noise and the wind, it wasn't ideal sleeping conditions for the kids. It wasn't a problem for us but it is something to consider if you are depending on those beds. The indoor area, kitchen and TV room, was great. We were really only inside while in the kitchen, otherwise, the house is situated perfectly for outdoor living. We ate, swam, played, relaxed for 6 days almost entirely outside and couldn't have been more comfortable. It's about a 5 minute walk to the beach and very close to the Harbor Reef and The Beach Dog. We had two dinners prepared in the home for us and the outdoor table easily sat us all and then some. The house has separate pool towels and beach towels so you do not need to bring any, there were more than enough for 14 people. A/C in the bedrooms as well as ceiling fans. I honestly can't think of one thing I would change about this house - maybe the owners - meaning I wish it was MINE! Enjoy! 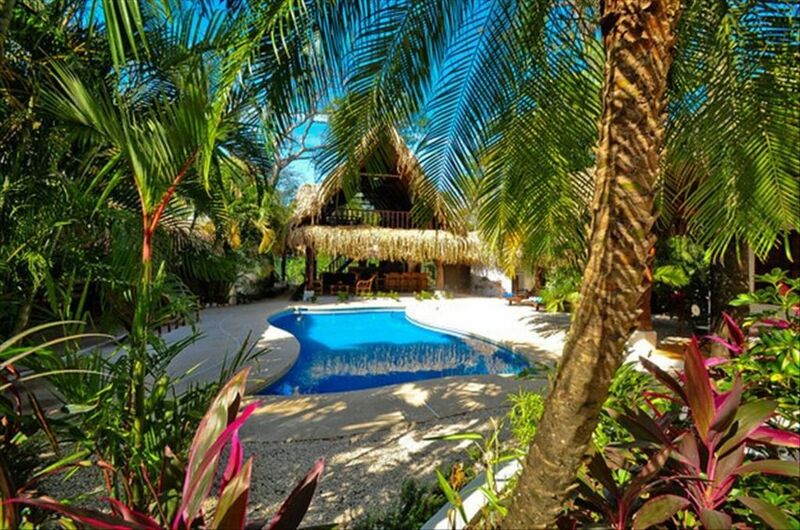 We had two families, total of 8, stay at Casa Cristal for spring break and it was lovely! Lots of room to relax around the pool. The four bedrooms gave us plenty of room and we could even watch the NCAA finals and the Masters on the TV in the family room. The kitchen was great and we enjoyed having the cook a few nights too! The ping pong table was a big hit with the kids and they loved walking to the beach everyday to surf! We went fishing one day and caught 4 sailfish! Great house to rent for a surfing and fishing vacation! We had 5 families totalling 16 people staying for a week at Casa Cristal. We were able to sleep all 16 comfortably. We loved the outdoor kitchen, and the pool deck area was perfect. There was always a spot on or near the pool deck where we could find shade. It was a very quick stroll to an amazing beach with fantastic surfing. Overall, I would highly recommend Casa Cristal. Our group of 9 stayed here in January and had a fantastic time. The house has everything you could need for an unforgettable vacation. We loved cooking and hanging out in the open kitchen and lounging by the pool. The layout and location of this property are excellent. The bedrooms are large and well appointed - it was great to have the extra bathrooms for a large group. We really appreciated the games, ping pong table and ring toss for evening entertainment. the proximity to the beach access, and shops and resto's was great. our group took surf lessons at Coconut Harry's; Kayak and Horseback riding tours from Boca Nosara, and Yoga classes at Harmony Hotel. The only difficulty we had was at first trying to figure out where to buy groceries since we didnt have a car - but we rented an ATV from a place down the street for $35 and went to the large supermercado in Nosara. Once we had that figured out - we were very happy at Casa Cristal Del Mar. We were a party of 8 and had the most amazing time. This place is a party/luxury palace compound with all the amenities. We will try and make this an annual vacy. We stayed at Casa Crystal for a week in December and we loved every second of our stay. The rooms were great, cleaning staff amazing, kitchen perfect. The location is the best. I am leaving a recommendation because Donnelle asked me too - but I really don't want to for fear that it will be rented when I want to go back ;). Can't recommend this place enough. Zip Line Canopy Tours - Glide through the jungle on a guided tour of the tree tops ! !